The Maitland News was a local newspaper originally published by the Maitland Realty Company (and later by the Maitland News Company) which began circulation in April 1926. 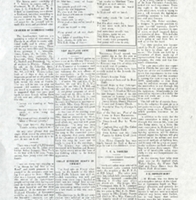 This edition features articles on topics such as the election of F. E. Adams as Mayor, the State Fireman's Association, the efforts of the Chamber of Commerce, a Parent-Teacher Association cake contest, library notes, pest control, the housing arrangements of local residents, and a local events calendar. Also featured are the lyrics to a new song about Maitland written by Mrs. I. Vanderpool, and several advertisements for local businesses. This edition is a photocopy of the original and is missing page 2. Photocopied 3-page newspaper edition: The Maitland News, Vol. 02, No. 10, March 9, 1927: Newspaper Collection, accession number 2014.002.020V, room 2, case 2, shelf 10, box GV, Maitland Historical Museum, Art & History Museums - Maitland, Maitland, Florida. Digital reproduction of original 4-page newspaper edition: The Maitland News, Vol. 02, No. 10, March 9, 1927. Maitland News Collection, Maitland Historical Museum, Art & History Museums - Maitland, Maitland, Florida. The Maitland News Collection, Maitland Historical Museum Collection, Maitland Collection, Orange County Collection, RICHES of Central Florida. Originally published by the Maitland News Company. Copyright to this resource is held by the Maitland Realty Company and is provided here by RICHES of Central Florida for educational purposes only. Poole, Leslie Kemp. Maitland. Mount Pleasant, SC: Arcadia Pub, 2009. "Maitland History." City of Maitland. http://www.itsmymaitland.com/maitland_history.asp. “The Maitland News, Vol. 02, No. 10, March 9, 1927.” RICHES of Central Florida accessed April 21, 2019, https://richesmi.cah.ucf.edu/omeka/items/show/6470.